Live in Synergy helps you achieve natural physical and emotional balance through the application of natural therapies and the use of essential oils. One of a few practicing Raindrop Technique professionals in regional South East Queensland, Barb combines unique, targeted massage and energy approaches with pure, authentic essential oils for a deeply harmonizing, rejuvenating, and relaxing experience. Better than a good night's sleep! 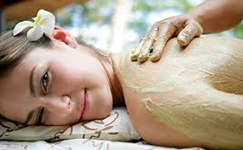 Aromatherapy massage is a beautiful experience that uses specialised techniques and pure essential oils to create a state of deep relaxation. Barb specialises in Raindrop Technique or Aroma Harmony sessions to relieve stress, harmonise and balance the mind and spirit. An Aroma Wrap is a luxurious full body exfoliation using Himalayan Salts mixed with high quality massage oil and essential oils; followed by a hydrating lotion applied with gentle massage. Your essential oil lotion is custom blended to suit each individual,which after application, has you completely wrapped and snuggled up, allowing all that moisture to soak in to your tired body. Your skin will feel baby soft after the treatment. Clients who have received this treatment have felt so relaxed and nurtured, they have not wanted the session to end. Did you know that the sense of smell reaches the unconscious mind immediately, connecting with memories, thoughts and feelings. Some of these bring you back to a time of warmth and love, sometimes not. Aromatherapy works with your feelings to enhance a state of relaxation, and to release unwanted emotions and memories. ​Just by using the right oils in an inhalation or in a body treatment, can do much more than relax you. It can open you up to new levels of emotional awareness and spiritual connection. This could be a gift to yourself or another. Treat yourself or loved one for the special price of $95 until Mother's Day. ​ Book your appointment or voucher before the closing date and receive a bonus raw cacao facial treatment. Yummy!